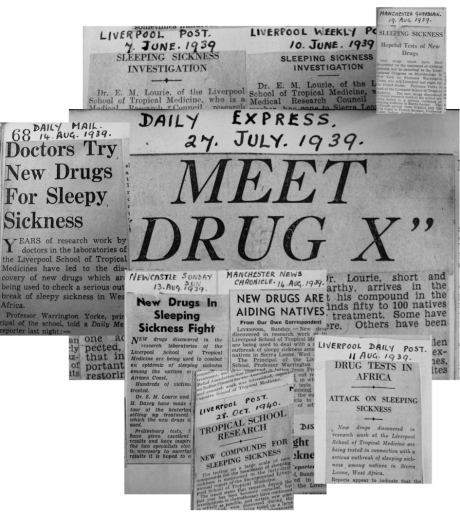 The results obtained with the experimental drugs in the treatment centers were excellent, “very promising,” according to most British newspapers. The drugs were only known by their code names (MB800, MB744). The Daily Express published a long story about “Drug X,” a secret drug “so hush hush that only…high-up medical experts know its name,” which had just been discovered by a public–private partnership between a subsidiary of Sanofi, the MRC, and a major global health research institution. On the field, the trial included 50 to 100 new patients who presented themselves in treatment centers each day; many of them too weak to walk, reported the Daily Express. All the specialists interviewed remained cautious until the successful results were announced in New York at the International Congress of Microbiology at the end of the summer. This outbreak in the Guinea-Sierra Leone transborder region occurred more than 70 years ago, in 1939. The disease was trypanosomiasis, or “sleeping sickness,” a parasitic infection transmitted by the tsetse fly, which provokes neuro-psychiatric disorders, cachexia (wasting), and often death. The drugs were pentamidine and propamidine, new molecules of the diamidine family, discovered months earlier at May & Baker, a London-based firm belonging to the Sanofi’s French ancestor, Rhone Poulenc, and tested at the Liverpool School of Tropical Medicine and in its colonial outposts. The work done by Lourie and his successors in the Kailahun District was one of the largest clinical trials ever conducted in colonial Africa. It led to the demonstration of the therapeutic efficiency of the diamidines, which counted among the wonder drugs of postwar tropical medicine, and to the extensive documentation of their (quite serious) side effects. The event took place at the outset of the Second World War, in the context of an unprecedented epidemic raging in the Guinea–Sierra Leone–Liberia tripoint zone: the exact area that was the initial focus of the current Ebola epidemic. It all started in April 1939 with a report from the eastern border of Sierra Leone, sent to London by the director of the Alfred Jones Laboratory in Freetown, a small research laboratory belonging to the Liverpool School: “The situation is as follows: there is a focus…extent not certain, around Dia. The two medical officers who have investigated the area are entirely unreliable but…this situation appears to call for a more careful investigation to determine the incidence of infection and the area of country involved.” Responding to the letter, Professor Warrington Yorke, the Dean of the Liverpool School of Tropical Medicine, immediately offered the expertise of the School to the Government of Sierra Leone. “We ought to offer to do a little more to help Sierra Leone…by sending out somebody.” Yorke had been supervising laboratory tests on the diamidines, which proved very effective on animals, and he was keen to see them tested on humans. Emmanuel Lourie, a MRC laboratory researcher with no colonial experience, boarded the Accra on May 31 carrying batches of the new drugs. Only 15 days later, he began to screen the populations for sleeping sickness cases near Kailahun, at the eastern border of Sierra Leone. In 1939, the colonial health services in Sierra Leone had absolutely no experience in sleeping sickness control: Lourie, the man in charge, had never worked in Africa. So they consulted the French doctors just across the border in Gueckedou, Guinea. The French colonial doctors considered the fight against sleeping sickness their national specialty; they had organized an impressive service covering the whole territory of French West Africa, with headquarters in Bobo Dioulasso. Their action was based on mobile teams for the screening and treatment of cases with standardized cures based on (Rhone Poulenc) injectable drugs. A network of “segregation camps” was set up for incurable cases and experimental work. In 1939, the Sleeping Sickness Service, nicknamed “La Trypano,” already had its dead heroes, its founding myths, and a considerable experience in the bureaucratic management of a continent-wide program, including the training of hundreds of African auxiliaries and the follow-up of millions of patients. The French were more than happy to advise the British. Gaston Muraz, head of the service, personally came to Gueckedou to meet with Lourie, and took him in the field to witness the functioning of a mobile team. He sent hundreds of pages of practical and legal advice to the Sierra Leone government to set up a similar program. The service never materialized on the scale of the Sierra Leone colony, but the “French system” formed the basis of the humanitarian-experimental infrastructure of the 1939 clinical trial in the Kailahun-Koindu area. Such transborder exchange was not exceptional in colonial medicine: it was indeed constitutive of most programs of disease control in colonial Africa. The circulation of knowledge and knowhow responding to the regional spread of the epidemic, which by the 1940s included the whole forest region of Guinea, Liberia, east Sierra Leone, and the western portion of Ivory Coast. Borders were not an obstacle to medical control; they made it possible. It is a coincidence, but the spatial overlap between the two epidemics is striking. In Sierra Leone, the “Kissi triangle” was the most affected in 1939 and it is today the “epicenter” of the Ebola epidemic, as CNN wrote in August (Swails and McKenzie 2014). Then and now, the epidemic extended all through the Kissi country, across the borders of Guinea and Liberia, and south towards Kenema and west into the Kono District. The superposition of the two maps is not an accident or an artifact of historical research. It points to the simple fact that the global health infrastructure now at work in the region has a long history: a history of treatment centers, of catastrophic mortality and saved lives, of people seeking or fleeing medical teams, and of medical heroes and foreign journalists, which started long before this summer of 2014. Anthropologists now working in the area might be able to tell us whether this past is present in memories: if this history of medical miracles and accidents had something to do (or not) with the sometimes very tense encounters between medical teams and populations in the current outbreak. It also reveals that several elements of the very infrastructure used in the current response are inherited from the years of trypanosomiasis control. In Sierra Leone, Médecins San Frontières (MSF; Doctors Without Borders) established one of its most important treatment centers in Kailahun (in a site away from the main hospital [see Open Street Map] to avoid disruption of its functioning); in their era, the British doctors followed a similar logic when they chose Kailahun as their base, and “recommended that the Leper Settlement at Kailahun be taken over by Government and maintained as a centre for sleeping sickness cases….” The head researcher of the trial, Emmanuel Lourie eventually settled in Koindu, a smaller locality further north that is heavily stricken by Ebola these days, where MSF has installed a referral center. I wonder if the same buildings are being reused, as it is the case in Gueckedou, Guinea, where MSF has installed its large treatment center in the old premises of the French Sleeping Sickness Service, still known locally as “La Trypano.” I don’t know about the precise geography of the Ebola response installations in Macenta and Nzérékoré, but these two Guinean towns also had large logistics bases for the colonial sleeping sickness service of French West Africa (the SGHMP) up until the late 1950s. Such reconversions are not surprising; the logics of spatial relegation are giving second lives to biopolitical infrastructures in many places of the world, such as leper stations becoming jails; TB sanatoriums becoming psychiatric hospitals; and sleeping sickness camps becoming Ebola centers. What is specific in the emergence of the West African Ebola epidemic has certainly more to do with cross-border connections than with cross-species transmissions. Most commentaries concerning the “ground zero” of the current Ebola outbreak, echoing the dominant scientific framing of Ebola as a zoonotic disease, have insisted on human–bat contact implicitly understood as abnormal and dangerous (and disgusting). As Mike McGovern (2014) has pointed out, the emphasis on bushmeat as the original source of the virus obscures the historically produced material conditions that have enabled its massive and unprecedented spread among humans. Instead of exoticizing a form of cross-species pathogen sharing (which is totally banal in itself), the current Ebola epidemic asks us to put the emphasis (both in terms of control and research) on the decisive role of the environmental, political, and historical conditions that rolled out the red carpet for virus transmission among humans, including the specific spatial patterns of human mobility in the region. It is worth going back to the work of Maximilien Sorre, an early figure of French biogeography who had a major influence on ecological science in France. 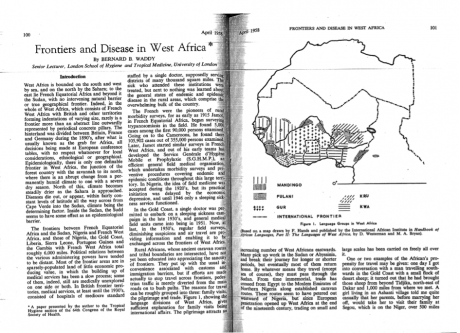 Writing in 1943 (at the moment of the Sierra Leone outbreak) and taking as an example the geography of African sleeping sickness, Sorre insisted that infectious diseases had to be understood at the scale of a “biological unit of a superior order: the pathogen complex…including, with man and the causal agent of the disease, its vectors and all the beings which condition or compromise their existence” (1943:293). The notion of “pathogen complex” led Sorre to propose one the first ecological understanding of infectious diseases, which gave a central role to anthropogenic ecosystems linked to agriculture, migration, irrigation or public works; it inspired medical historian Mirko Grmek’s concept of “pathocenosis,” which referred to specific associations of environments, human societies, animal species, and diseases (Grmek 1969). The Liberia–Guinea–Sierra Leone tripoint may be seen as a specific transborder “pathocenosis”: a bio-political environment producing rubber, diamonds, parasitic diseases, emerging viruses, and war injuries. To my knowledge, neither Sorre nor Grmek thought of frontiers as defining specific “pathogen complexes.” Interestingly, one of the first reflections on frontiers-as-pathological-environments in Africa was written in 1958 by Bernard B. Waddy, a Gold Coast colonial doctor with a long experience of trypanosomiasis control and a long history of interaction and friendship with the French doctors across the border. This is not the first time that frontiers have played an important role in the making of an Ebola epidemic, as Célia Gasquet showed in her work on the 2001–2002 outbreak at the Gabon-Congo border (Gasquet 2010). In the West African tripoint zone, or at the Thailand-Cambodia border where artemisin-resistant Plasmodium falciparum were detected in the summer of 2014 (Packard 2014), frontier environments shape the global landscape of emergence of disease and drug resistance. New epidemics seem to call for historical research: they open new perspectives on the past just as they require new critical engagements (Fee and Fox 1988). They call for “histories of the present” which can help question the taken-for-grantedness of our categories and responses. What histories does the Ebola epidemic ask for? What are its urgent pasts? It could be, as some suggested, the 1980-1990’s experience of structural adjustment and health “reform” or, closer to us, the last decade of “pandemic preparedness” fireworks and failures–and the sedimented traces of colonial biopolitics in the area. Liverpool Post, 7 June 1939. Liverpool Daily Post, 11 August 1939. My narrative is based on the Liverpool School of Tropical Medicine Archives, LSTM, TM18/3/75/, Sierra Leone. Also see Lachenal (2014). 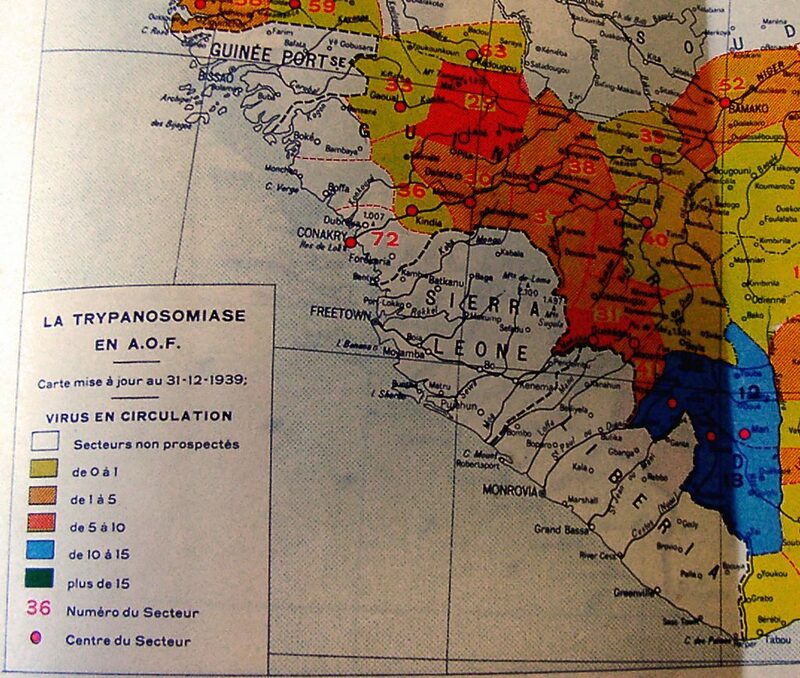 On sleeping sickness in the area of Gueckedou, Macenta, and Nzérékoré, and the French trials of the diamidines, see Diallo (1951). For a spatial analysis of the current Ebola epidemic in Sierra Leone, see Richards et al. (2014). Diallo, J. 1951. “Résultats de la chimioprophylaxie par les diamidines dans le secteur spécial No 3, à Gueckedou-Kissidougou (Guinee).” Bulletin de la Société de pathologie exotique et de ses filiales, 44(1–2):93-103. Fee, Elizabeth, and Daniel M. Fox, eds. 1988. AIDS: The burdens of history. Berkeley, CA: University of California Press. Gasquet, Célia. 2010. “Ébola au Gabon et au Congo: Logiques transfrontalières de survie et gestion transnationale de la crise épidémique de 2001-2002.” In Frontières et santé: Genèses et maillages des réseaux transfrontaliers, edited by F. Moulle and S. Duhamel. Paris: Géographie et Culture, L’Harmattan. Grmek, Mirko. 1969. “Préliminaire d’une étude historique des maladies.” Annales ESC, 24:1437-1483. Lachenal, Guillaume. 2014. Le médicament qui devait sauver l’Afrique. Paris : La Découverte. McGovern, Mike. 2014. “Bushmeat and the Politics of Disgust.” Fieldsights – Hot Spots, Cultural Anthropology Online, October 7 2014. Available at link. Richards, Paul, Joseph Amara, Mariane C. Ferme, Prince Kamara, Esther Mokuwa, Amara Idara Sheriff, Roland Suluku, and Maarten Voors. 2014. “Social Pathways for Ebola Virus Disease in Rural Sierra Leone, and some Implications for Containment.” PLoS Neglected Tropical Diseases, October 31. Available at link. Packard, Randall. 2014. “The Origins of Antimalarial-Drug Resistance.” New England Journal of Medicine, 371(5):397-399. Sorre, Maximilien. 1943. Les fondements biologiques de la géographie humaine: Essai d’une écologie de l’homme. Paris: Armand Colin. Swails, Brent, and David McKenzie. 2014. “Treating Ebola in Sierra Leone: ‘We Are Two Steps Behind.’” CNN, August 9. Available at link. Waddy, Bernard B. 1958. 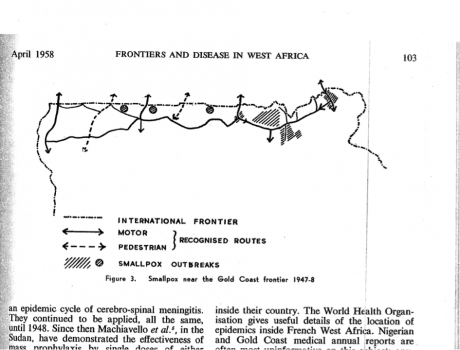 “Frontiers and Disease in West Africa.” The Journal of Tropical Medicine and Hygiene, 61(4):100-107.